1. An inexpensive netbook slipcase from SwissGear with a small zipper pocket. This is where the iPad lives whenever it isn’t in use. 2. A cheap screen protector. Should have spent more here. Oh well. 3. 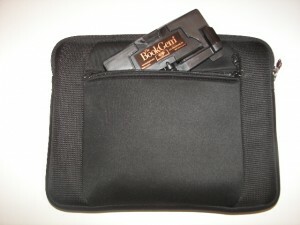 An inexpensive iGg Slim Leather Case. No stand, no screen flap or extra protection. 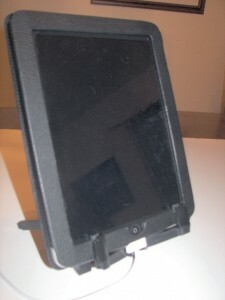 Just a very thin, and light case to shield the iPad while is use and give it a little extra grip for ease of holding. 4. A small, light, inexpensive stand. More on this one in a moment. The key to all of my purchases was that they work together at all times. I don’t want to have to take the iPad in and out of one case to put it in another. 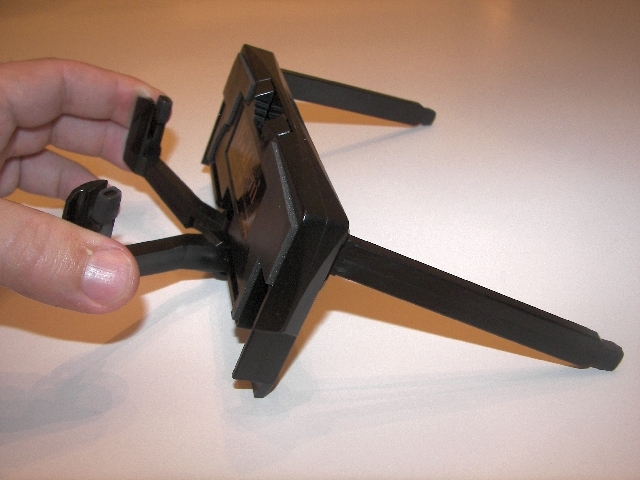 I don’t want a stand that won’t fold up for portability. I don’t want cases that block chargers or headphones, even 3rd party ones. My iGg case had to fit inside the SwissGear slip case. The SwissGear case had to have a big enough zippered pocket to fit the accessories that I need with me all the time. Fortunately for me, these two cases work great together, and they cost less than $40 combined. After acquiring the “must have” accessories, I set out looking for the fourth item on my list- an iPad stand. This market seems to have blown up overnight. I think part of the reason for this is that Apple’s own offerings are too expensive and not very versatile. They only hold the iPad in Portrait configuration (at least without some modification or extra hardware) and they aren’t all that portable. So there we are. The floodgates have opened and there has been a steady tide of various kinds of stands and cases with built-in stands from all corners will all kinds of shapes and sizes. While taking on the mind-numbing task of wading through all of these offerings, I found a constant theme- very few of them met my criteria of versatility, utility, and value. All of the cases stands were out right away for me. I already had that base covered. Then there are stands out there that either don’t work in both portrait or landscape, or don’t allow the charger to be connected in both. These were also a no go. Then I started looking at some of the offerings that met my versatility and utility requirements. Many of them were big and bulky. I really didn’t expect to find a stand that would fit in the zippered pocket of my slipcase, but I didn’t want to be lugging some huge piece of plastic around that wouldn’t at least fold up for transport. Then, the stands that I found that were more portable, well, most of them blew holes all in my budget. I found that you can spend as much as you want on one of these things, especially the ones from the usual Apple accessory subjects. You know who I’m talking about. I quickly got to the point of counting my contenders on one hand. During one of my searches, this time on Amazon.com, I came across the BookGem. I can’t remember my exact search criteria, but it wasn’t one of the first choices to pop up. In fact, it was several pages deep in my search. 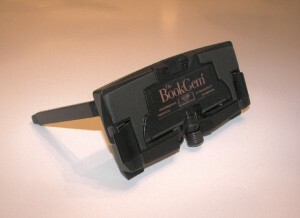 The BookGem is a stand that claims to be able to hold any book, e-reader, or tablet computing device in either portrait or landscape orientation. Considering the bold claims, it certainly looked pretty unassuming. However, the $14.95 price tag certainly caught my eye. There wasn’t too much information on the Amazon storefront, but the reviews definitely made an impression. They were overwhelmingly positive, and most of the lukewarm reviews were from people using it as a book stand. Next, I did my due diligence and started scouring Google looking for whatever I could find on the BookGem. I looked at their website, which had more pictures and information than the Amazon page. It was nice to see some pictures of the BookGem in use, doing exactly what they say it will do. After clicking the link on the home page with all of the e-reader and iPad pictures, I ended up on what looked to be the original home page for the company. While the first page showed the BookGem doing it all, the page beneath painted a different picture. 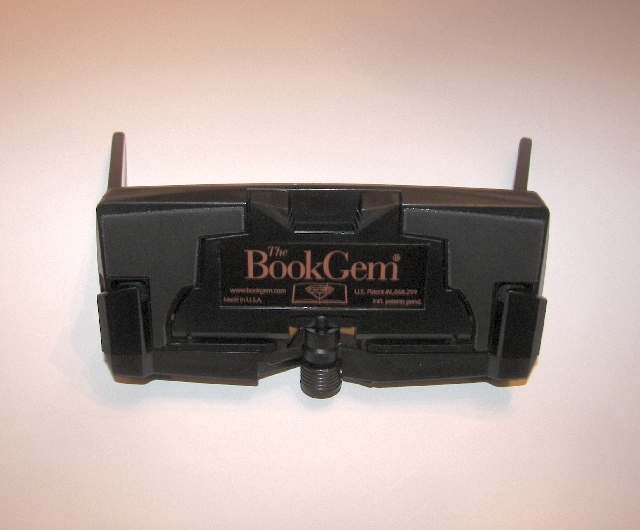 This BookGem depicted here looked more like a simple book stand. This made me wonder if it was simply being repositioned to make more cash, and if so, was it really up to my expectations. The BookGem started to seem a little too good to be true, but I remembered all the positive reviews from Kindle, Nook, and iPad users that I read through. I went ahead and took the plunge and bought one. At $14.95, this was a possible mistake I could actually afford. It is easy to read the specs of an item, and not grasp them until you see the thing up close. I was busy while I waited for delivery of my BookGem, so I didn’t go off drawing dimensional diagrams or anything. I just waited to see what I would end up with when it arrived. I was very surprised when I opened the package. This thing is TINY. As soon as I busted it out of the plastic, I tried putting it in my slipcase pocket, and it actually fit with plenty of room to spare. I really didn’t expect to find a stand that would actually fit in there, much less with other stuff. Now, I am able to carry my BookGem, charger, USB cable, and a cleaning cloth with me all the time. The BookGem passed the first test with flying colors. So then it was time to take the BookGem for a spin. I discovered that it is well thought out and designed, and very functional. The back has two legs that fold out for support. They are long enough to steady the BookGem in each of its configurations. Each is covered with a band of rubber to prevent slipping. The spring loaded jaws are located in the front. They also have a rubber covering to prevent bare plastic from scratching your device. 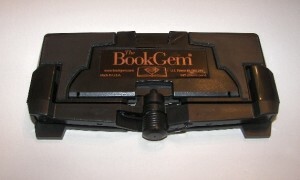 The base of the BookGem also has padding on each side to cushion the device once the jaws are engaged. Once the legs are extended, you just pull the jaws out and slip them over the device. This can be done with one hand, but only if you have large hands or long fingers. I can do it, but just barely, and I have good sized hands. This isn’t a problem, as you can use two hands to get them extended, and then use one hand to hold them in place for the iPad. 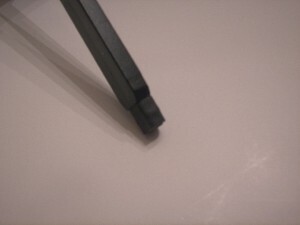 Also, you have to be sure to ease them back down onto the iPad bezel, as the spring has a fair amount of tension on it. You wouldn’t want to let go of it and have it smack your beloved iPad’s glass. Next, I tried out all four of the possible iPad configurations. They were all functional, to varying degrees. 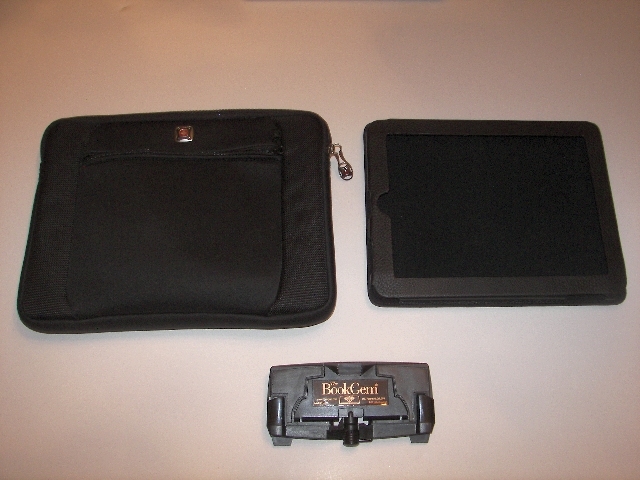 The BookGem also worked with the charger and/or the iGg case in all four setups. So far, this thing is batting a thousand. It isn’t perfect, to be sure. You can tell after using the BookGem for a while that it wasn’t designed specifically for the iPad. Let’s break down each configuration, and hit the good and the not so good points for each. I tend to use my iPad more in the Landscape configuration, but this view is probably better for viewing books and some photos. I wouldn’t recommend doing tons of typing using this orientation. It is fine for a login here and an email address there, but the angle is a little steep for comfortable extended typing. As you can see from the photo, as long as the iPad is centered and the dock connector is short enough, the charger works just fine, with no cable stress in this setup. The Apple USB cable is perfect for this, and I would recommend you use it. Due to the height and weight of the iPad, there is a little movement back and forth, especially if you are pressing icons on the top of the screen. If you press gently, there is just a slight give to it. This may annoy some people a bit, but as long as you have the legs fully extended, the BookGem will not topple over with the iPad without some extreme abuse. The legs are long enough to keep it held down while tapping harder than most of us would feel comfortable. It almost hurt me to try this. Guess I’ll never get a job at one of those places that microwaves iPads, or drops them out of second story windows. Oh well. The rubber feet on the BookGem’s legs also keep the iPad in place except for very slippery surfaces. I did my tests for this review on a ceramic tile surface, and it held up well. The iPad stayed still during typing, but would move slightly when I pressed the Home Button. I’ll admit right off the top that I hardly ever use the iPad in this orientation. Placing the BookGem at the top of the iPad can help when light is hitting the iPad at odd angles (we all know about the screen glare, right? ), but are typically used for extended typing. The slighter angle is much more comfortable for typing, as your wrists are able to stay in a more natural position. However, I tend to prefer the wider keyboard offered in the Landscape orientation. I have big fingers, so I tend to make mistakes on the narrower Portrait keyboard. This is just my personal preference. As you can see, this setup is by far the least conducive to using a charger. Even with the Apple USB connector, the cable is flattened and strained just a tiny bit. Fortunately, with the iPad’s great battery, I rarely need the charger while working, anyway. It’s just nice to know that it will work if I have to use it in a pinch. 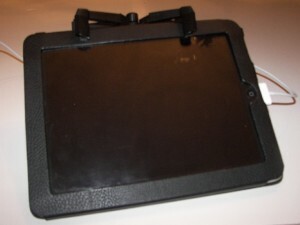 In my iGg case, the iPad is rock solid stable in this orientation. Just to be clear, this orientation is much more stable than its Landscape counterpart. More on that in a moment. It actually works pretty well in my lap, as long as I have pants on, as well. I would be a little leery of using this configuration on hard or abrasive surfaces with a naked iPad, however. The bottom edge will slip around and could get scratched up. A mouse pad or something of that sort would clear this issue up, but do you want to carry something else around? If you keep your iPad in a case all the time like me, then this isn’t an issue. This is the most common of the four orientations for me. It is perfect for what I do. At work, I use my iPad to pull up notes and documents and work with them. I am usually doing more viewing, with just a little typing and editing. I tend to view documents, like spreadsheets, that look better in a Landscape view, so this works well for me. At home, I am looking at Twitteriffic, Reeder, Pocket Informant, and using Safari. I also use it for TV and movies from various sources. All of these work great from Landscape at this angle. Both of the Landscape orientations are perfect for charging during use. The dock connector is up off the ground and exposed. Thanks to iOS’ automatic screen rotation, you can have the cord on either side, if that makes a difference. Both Landscape setups work a little better with the dock connector to the right, so the orientation and volume buttons are then exposed at the top and easy to get to. The iPad has a slight give in this orientation, but even less than in Portrait. It is very stable overall. The BookGem definitely isn’t going to fall over in this configuration. There is one small issue with this setup. Remember when I said the BookGem wasn’t made specifically for the iPad? 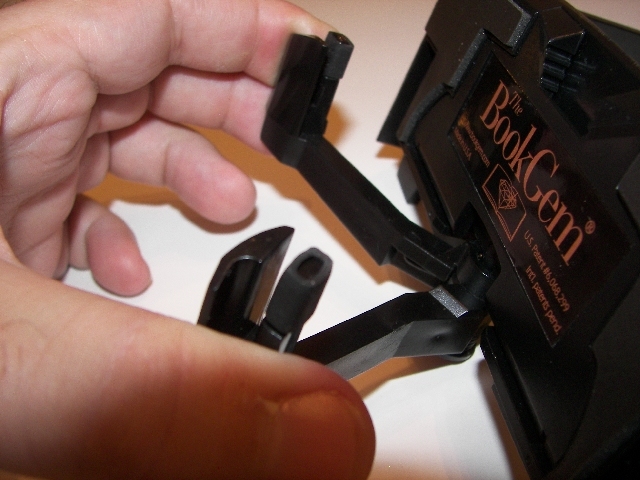 The jaws of the BookGem are made to be long enough to hold multiple pages of a large book. 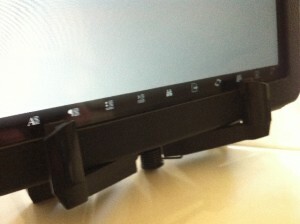 The bezel of the iPad is a little more shallow on the sides, so the jaws overlap the screen ever so slightly. This is not a huge problem and rarely gets in the way. In a program like Docs To Go, where you have a row of small icons at the bottom of the screen for document functions, you can see the issue. The icons aren’t covered up, but you do have to aim a little high for the ones that line up with the jaws. You may also have to work around this when the keyboard is up, which is easy since the Space Bar is a big target. This small issue is not a deal breaker, but worth being aware of. This is an orientation that I use when I need to do some typing. I often use my iPad to take some quick notes for work or for reviews in Evernote. I also tend to use my iPad over my laptop for meeting notes when I can get away with it. The iPad’s smaller profile presents less of a barrier between me and the presenter, and it is a great ice breaker. As I said before, I prefer the Landscape keyboard, so using this setup makes sense for me. There is one problem with this setup, though. 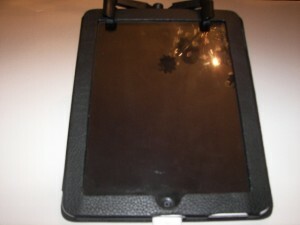 You have to use a light touch, or the iPad can start to slip out of the BookGem’s grip, especially on slippery surfaces. This is due to the taper on the back of the iPad. 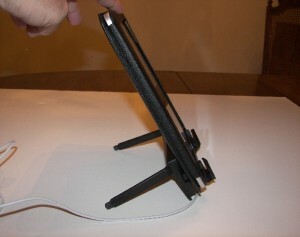 The curvature prevents the BookGem from sitting completely flush against the iPad. This problem is quite pronounced without a case. I actually wouldn’t recommend using the BookGem in this orientation with a naked iPad. 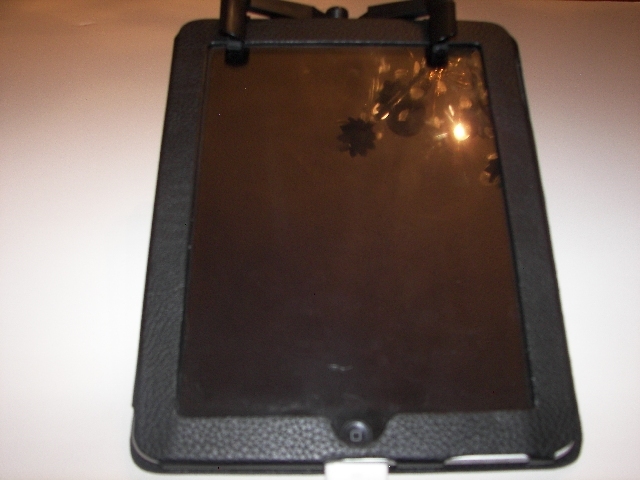 With my case, even though it is thin, the iPad is more stable and usable. The jaws of the BookGem have a wide spring rang, geared toward large hardcover books, so a thicker case with more material for it to grip may help even more. This is another instance where you can tell the BookGem wasn’t made for the iPad alone. This issue aside, this is still my second favorite setup. I have learned to work around its limitations for the advantage of typing in Landscape. A light touch on the keyboard is all you need to be ok. So, how does the BookGem come out in the end? I’d say it does pretty darn well. On the utility end, it does an admirable job. It holds the iPad in 4 different positions and angles. 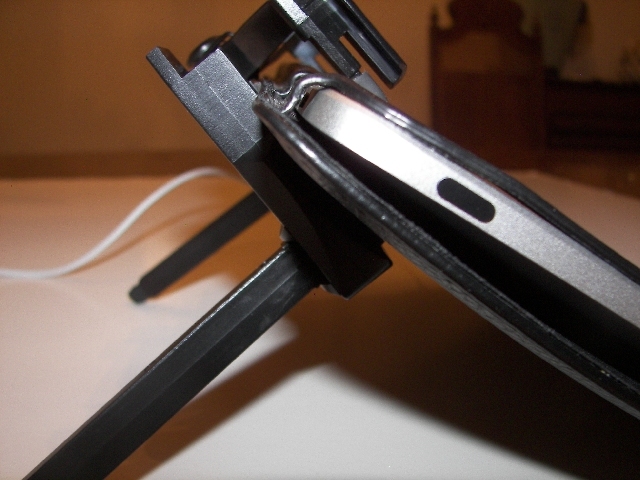 Some are better than others, but they all do work, and that is more than a lot of the iPad stands out there can claim. It is also very compact and lightweight. How about versatility? This is the BookGem’s strongest attribute, in my opinion. Not only do you get the 4 iPad configurations, but you get a versatile e-reader and paperback and hardcover book stand, as well. The BookGem also works great for watching movies or photo slideshows from your iPhone, iPod Touch, as well. 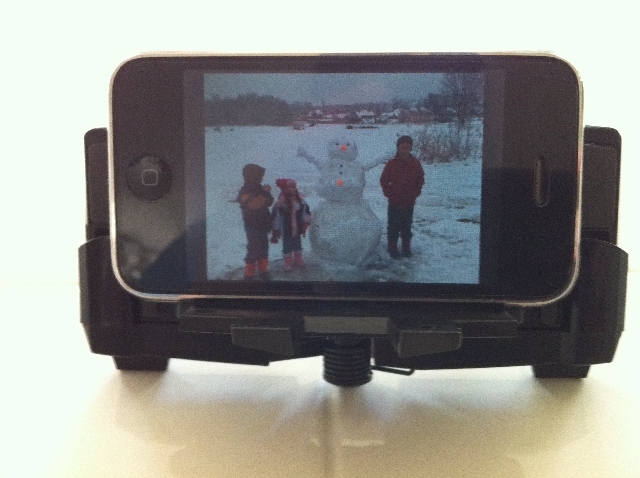 In fact, this works great for any smartphone that displays in Landscape orientation. The flap that folds down for supporting books does a fine job of supporting these smaller devices. Then we come to value. At $14.95, it is hard to have any complaints on this point. Yes, there are a couple of issues. However, when you consider the fact that most of the BookGem’s competitors can’t match it feature for feature, these small issues pale a bit. In fact, you will have a hard time finding another stand that offers the combination of features and portability anywhere close to this price. So, where do I come down on the BookGem? Like I said earlier, I am demanding when it comes to my accessories. There are certain things that I expect, and I can definitively say that the BookGem meets all of my expectations for utility, versatility, and value, and does so with flying colors. 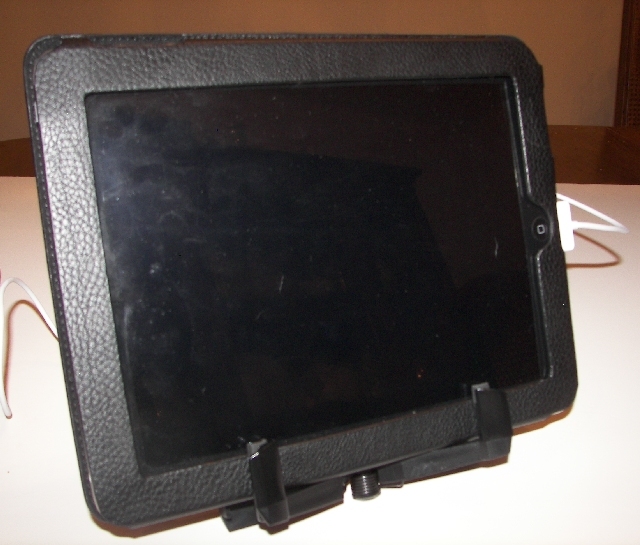 The BookGem can easily serve as a primary stand for the iPad, and for those that already have one they like, it also makes a great secondary portable or travel option. The BookGem can be found and purchased here. The BookGem was independently purchased by the post author in the iPad App Store. For further information regarding our site’s review policies, please see the “About” page. Previous PostGood News: Camera Mentioned in iPad Configuration PoliciesNext PostFridgePad – Is That a Good Idea?